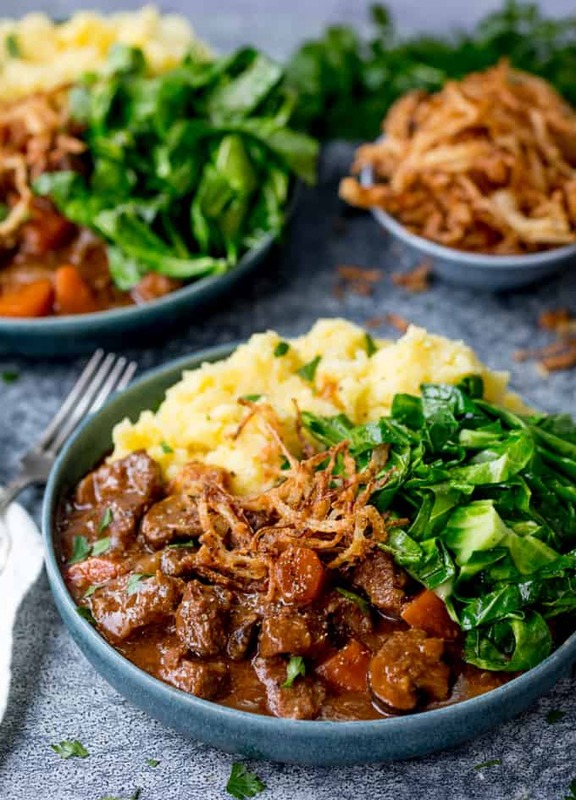 Stick-to-your-ribs comfort food for a cold, rainy day, this slow cooked Beef and Guinness Stew with Crispy Onions is perfect! This recipe was sponsored by CrockPot. 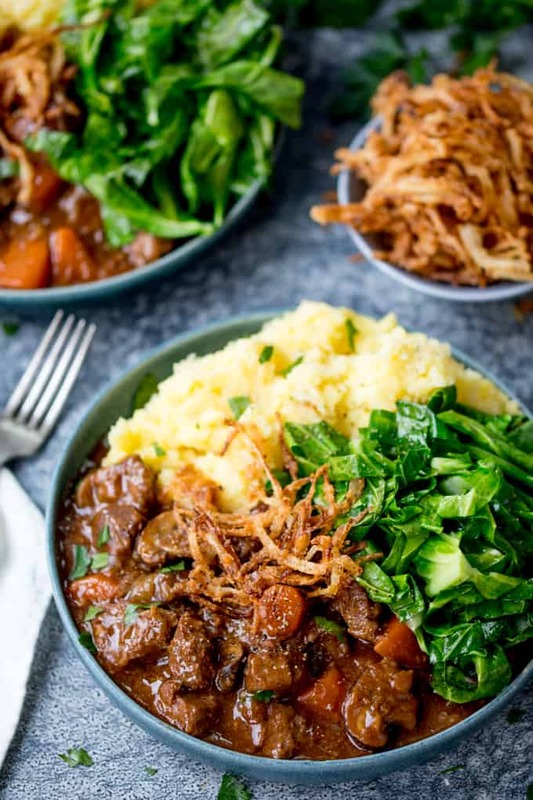 Fluffy jumpers, thick socks, a blanket on the sofa, listening to the rain at night when you’re tucked up cosy in bed, and slow-cooked, make-your-kitchen-smell-amazing dinners. Yeah, I’m so ready for Autumn. To be fair, I could eat a casserole in the middle of Summer (have you seen my summer casserole? 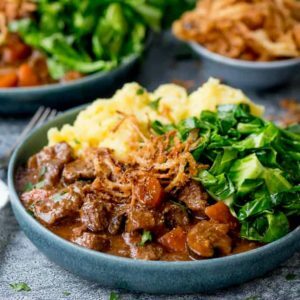 yes, it really is a thing), but this hearty Guinness casserole, with thick, rich gravy and fall apart beef, all serve up with mashed potatoes and buttered greens is definitely winter food. It doesn’t need them, but whenever I make them, I always vow that I’ll make them for every casserole and soup forevermore. They’re a simple mix of thinly sliced onions, plain (all purpose) flour, salt, pepper, garlic salt and paprika which are fried in hot oil. Coming back to the stew itself. This is a big batch recipe – for 8 people. It freezes well, so you can eat some and freeze a batch for quick midweek meal. Then add garlic, Guinness, stock, tomato puree/paste, bay leaves, dark brown sugar, salt and pepper and place a lid on and cook for 4-7 hours (depending on setting). Easy as that! So let’s talk Crockpot. Specifically this CrockPot. 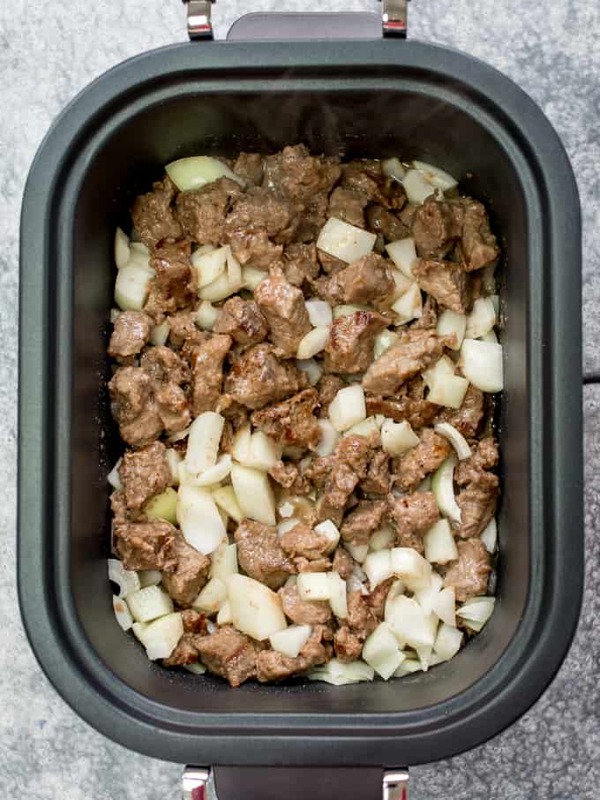 There’s a sear function that allows you to sear your meat and any other ingredients right in the Crockpot. No need to dirty another pan or transfer big piles of seared food to the slow-cooker (which inevitably ends up mostly on my work surface). And it works really well (I seared a whole lotta meat in one go with no problems). That hands-down 100% sold it to me. It could have had no other functions, and I’d have been happy. It’s got a digital timer, telling you how long is left. It’s a simple thing, but too many slow cookers don’t have it. The bowl is dishwasher safe. Yaasssss! It’s got a keep-warm mode – so once your food is ready, you can keep it warm without the fear of everything turn to mush or drying out. It’s got other fandangly features that I haven’t yet tried, but made me go ‘What?? no way’. Like the steam feature, the roasting feature and the baking feature. I’m looking forward to trying them out. Yes, replace the Guinness with gluten free pale ale (Brewdog do one) or gluten free golden ale. Replace the plain (all-purpose) flour with gluten free flour blend. Ensure the stock and tomato puree/paste is a gluten free version too. Can I make it alcohol free? Yes – this stew takes a while too cook, so start it in the morning, and it will be ready for dinner. If you want to make it the day before, simply cook, cool, cover and refrigerate. Then reheat until piping hot the next day. Yes. 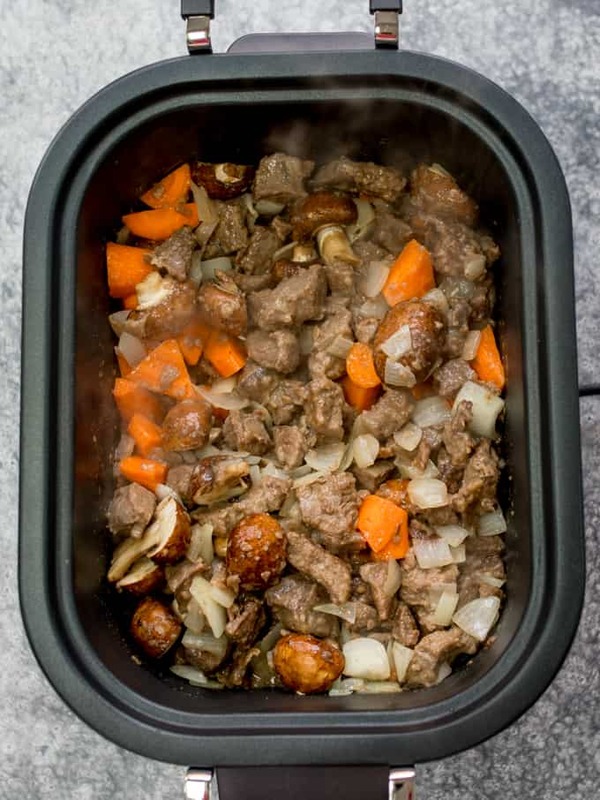 Leftovers can be cooled, covered and frozen. 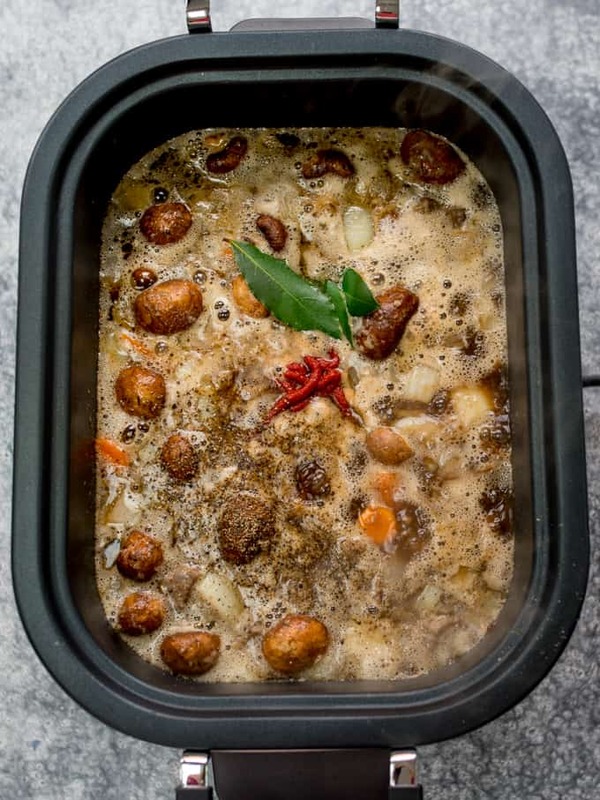 Defrost thoroughly in the fridge overnight, then reheat until piping hot. Turn on the sear functions on the Crockpot and add the oil. Dust the chunks of beef in the seasoned flour and fry for 7-8 minutes until golden brown all over. Add the onions and cook for a further 5 minutes. Stir in the garlic. Add in the Guinness, stock, tomato puree, bay leaves, sugar, salt and pepper. Bring to the boil then change the setting to slow cook. Choose either high for 4 1/2 -5 hours or low for 6-7 hours. When your stew is almost ready, start preparing the crispy onions. Heat the oil in a large pan (make sure there pan is filled no more than 1/3 full to prevent it from bubbling over). 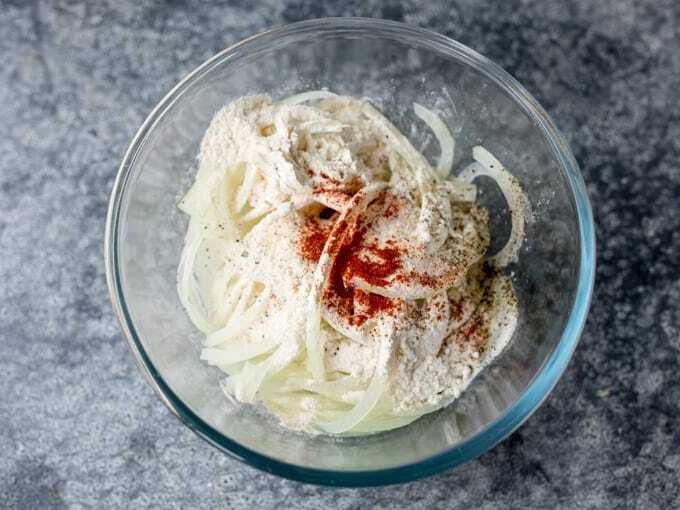 Mix the onions slices with the flour, salt, pepper, garlic salt and paprika. Test the oil is hot enough by placing one of the onion slices in the pan. It should bubble instantly. Cook the onions in 3 or 4 batches for about 2-4 minutes until golden and crispy. Be careful when putting the onions in the oil as the oil will bubble fiercly. When cooked, place on some kitchen roll to drain. Dish out the stew (removing the bay leaves first), and place a heap of onions on top of each dish. Serve with mashed potato and green veg. Yes, replace the Guinness with the same amount of beef stock. I also like to give it an extra kick by adding half a tablespoon of vinegar (the picking juice out of jarred beetroot is particularity good). Yes - this stew takes a while too cook, so start it in the morning, and it will be ready for dinner. If you want to make it the day before, simply cook, cool, cover and refrigerate. Then reheat until piping hot the next day. 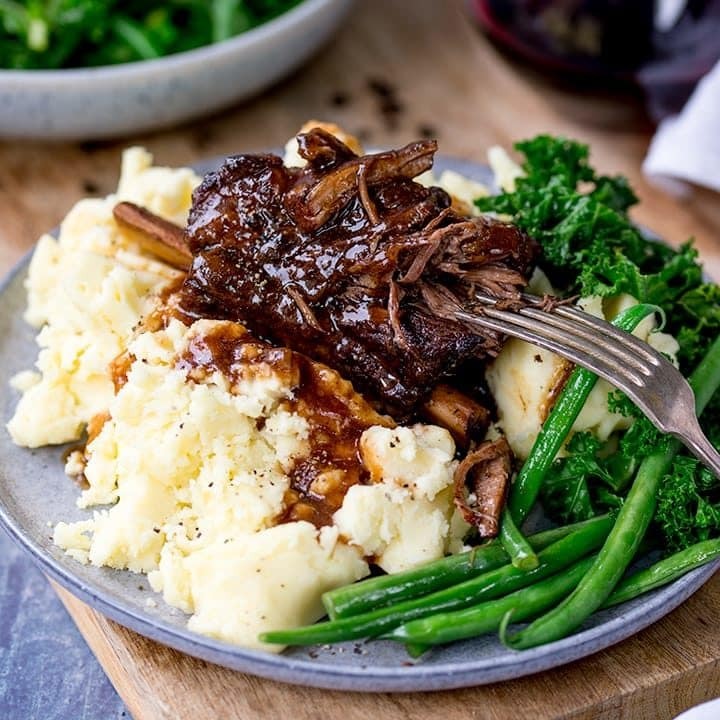 .Nutritional Information is per serving, allowing for 3 tbsps of oil being absorbed during the cooking of crispy onions & without serving suggestions of mashed potato and green veg. This post was first published in February 2015. Updated in September 2018 with updated recipe, new photos and tips. 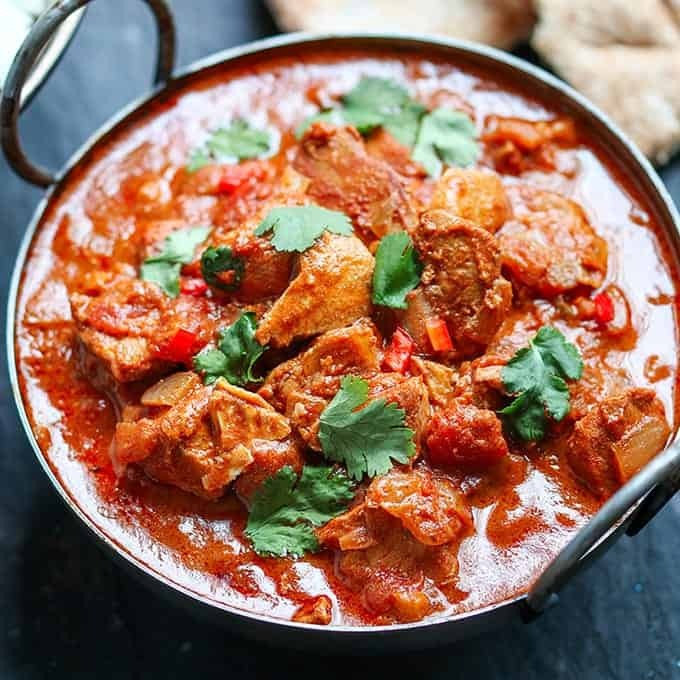 Could I cook this in a Dutch oven/casserole dish on a gas hob or in an oven and if so how long would you recommend cooking for and what temperature? Hi Paula, yes, you could cook it in the oven. I would recommend 160c/325f for 3-4 hours, checking occasionally after about 2 hours. Hope that helps! I don’t care is it’s 120 degrees out, I’ll eat a casserole. 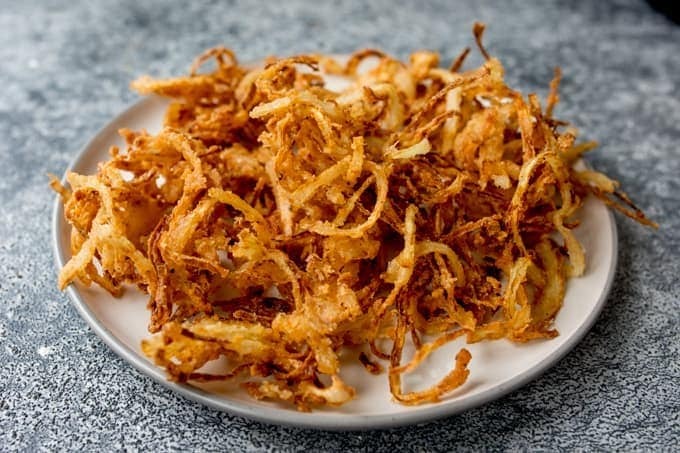 Especially with those fried onion, those things look awesome!! But it is getting cooler, and this is just perfect for that cold weather (cold=68 degrees in san diego). Lovely recipe. You wouldn’t guess there was Guinness in it once it’s done, but it makes a beautiful “gravy”. Being an incorrigible fiddler I added diced celery and a good bit of finely chopped root ginger to mine. I’d go by 4-6 oz stewing steak per serving rather than 8 oz, but maybe we’re light eaters. Thanks Nicky! I have had my Crockpot for some time now and find it marvellous! 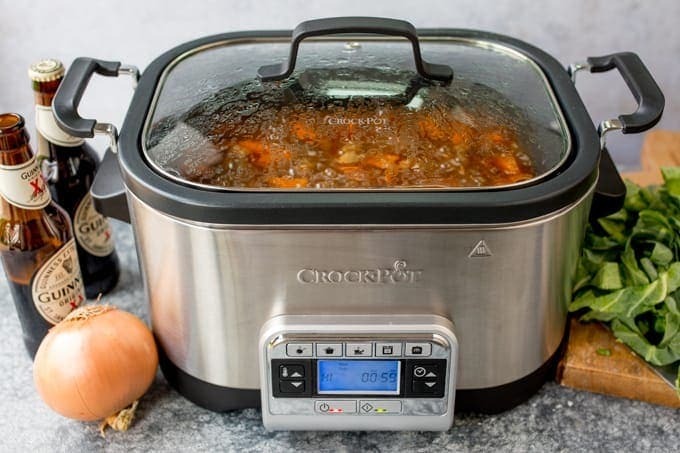 It is the best slow-cooker I ‘ve Had ( my last one I had for about 30+ years) . The sautéing feature is especially useful . Certainly cuts down the washing up. Going to try your recipe in the next few days. Thanks . Another idea for Alcohol Free: I have substituted an equal amount of Coca Cola (Not Diet Coke!) and a splash of vinegar for Guinness in my Guinness stew recipe and it tastes great! 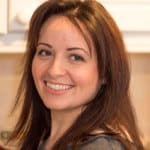 Hi Nicky- can I cook this in a conventional electric slow cooker? If so any tips for technique? 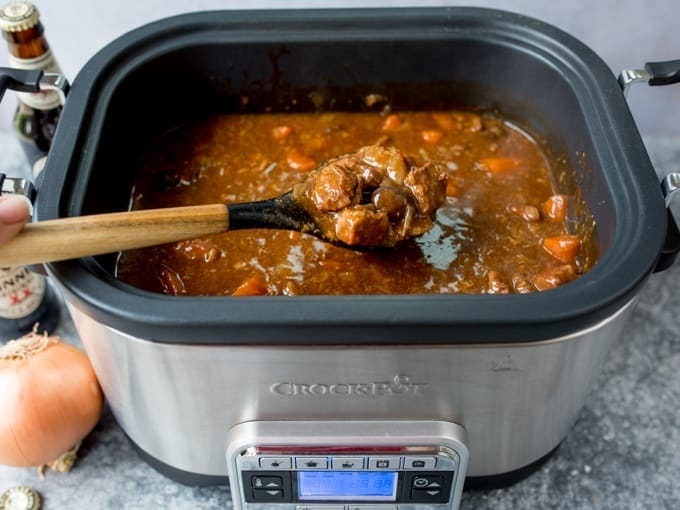 Yes you can use a conventional slow cooker. You will need to sear the meat in a pan on the stove top/hob first (upto step 4). 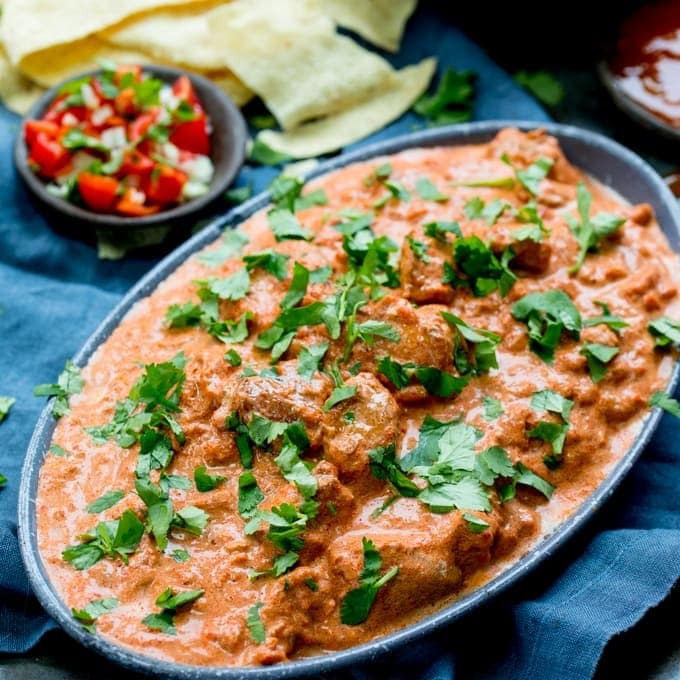 Been waiting for autumn for some delicious comfort food recipes, this one is up there as one of the best. I could ladle bowls of this. Absolutely delicious! 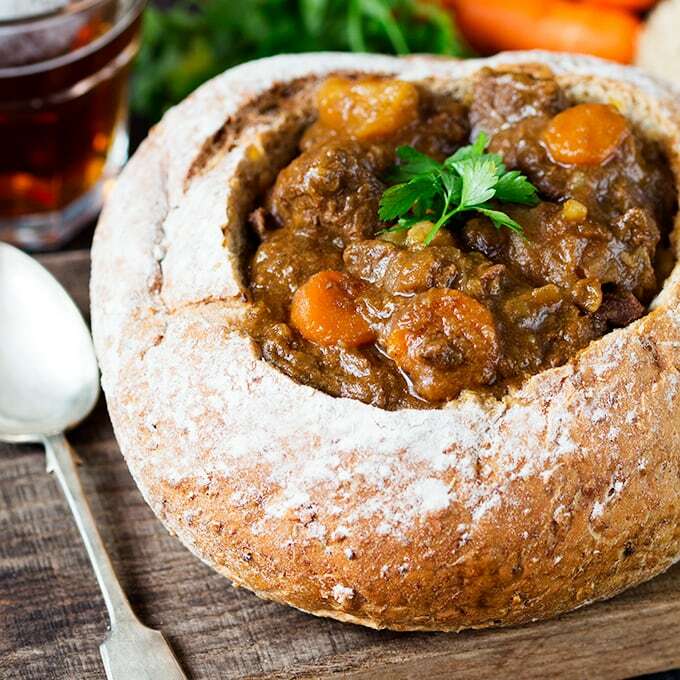 This looks absolutely amazing and so comforting and love the idea of a slow cooker bowl that can go on the hob. I am all for saving on washing up!